Making crochet flowers is a quick and rewarding project that is suitable for all levels of stitchers. Once you understand basic crochet stitches, you can whip up these beauties in no time. These free patterns for crochet flowers are the perfect craft embellishment. This pretty flower with contrasting colors is easy to make. 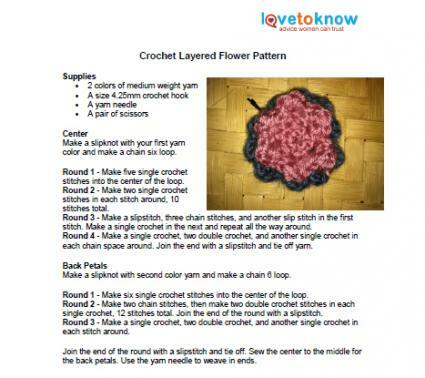 Download and print this layered flower pattern. Make a slipknot with your first yarn color and make a chain six loop. Round 1 - Make five single crochet stitches into the center of the loop. Round 2 - Make two single crochet stitches in each stitch around, 10 stitches total. Round 3 - Make a slip stitch, three chain stitches, and another slip stitch in the first stitch. Make a single crochet in the next and repeat all the way around. Round 4 - Make a single crochet, two double crochet, and another single crochet in each chain space around. Join the end with a slip stitch and tie off yarn. Make a slipknot with second color yarn and make a chain 6 loop. Round 2 - Make two chain stitches, then make two double crochet stitches in each single crochet, 12 stitches total. Join the end of the round with a slip stitch. Round 3 - Make a single crochet, two double crochet, and another single crochet in each stitch around. Join the end of the round with a slip stitch and tie off. Sew the center to the middle for the back petals. Use the yarn needle to weave in ends. This fancy little flower looks great on hats, handbags or even when used as a bookmark. Click for a downloadable, printable pattern. 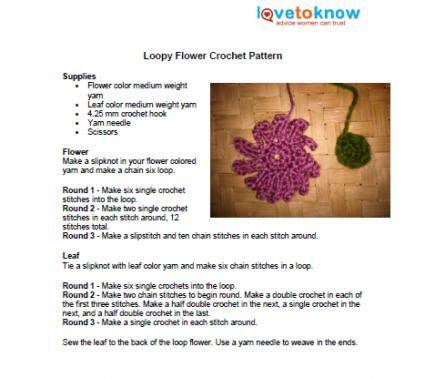 Make a slipknot in your flower colored yarn and make a chain six loop. Round 3 - Make a slip stitch and ten chain stitches in each stitch around. Tie a slipknot with leaf color yarn and make six chain stitches in a loop. Round 1 - Make six single crochets into the loop. Round 2 - Make two chain stitches to begin round. Make a double crochet in each of the first three stitches. Make a half double crochet in the next, a single crochet in the next, and a half double crochet in the last. Round 3 - Make a single crochet in each stitch around. Sew the leaf to the back of the loop flower. Use a yarn needle to weave in the ends. Crocheting has been around for thousands of years in one form or another. Through the ages, people have come to appreciate this beautiful form of handiwork and the pleasure that is found in creating unique pieces. Crochet flowers are easy to make and offer beginner stitchers a chance to practice what they know while creating attractive handmade pieces.